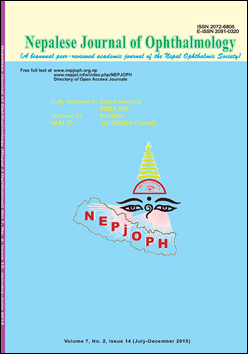 Official journal of the Nepal Ophthalmic Society. Full text articles available here and on the journal's own website. Nepalese Journal of Ophthalmology does NOT charge authors for article submission and processing fees. Articles are licensed under a Creative Commons Attribution-NonCommercial-NoDerivatives 4.0 International License (CC BY-NC-ND). Nepalese Journal of Ophthalmology is included on DOAJ. Pain in and Around the Eye: How Big is the Problem?